When the babe and I are alone on Friday mornings, I'm all about finding simple ways to entertain her while I catch up on laundry and cleaning. Today I made some quick shakers. One was colorful and the other two made some fun sounds. I just stuck several objects in ziploc bags and watched to see what she did with them. She grabbed, she shook, she attempted to chew on the bags (which is why this activity needs some adult supervision :)), and she felt the bags. Each had a different texture depending on the objects inside. 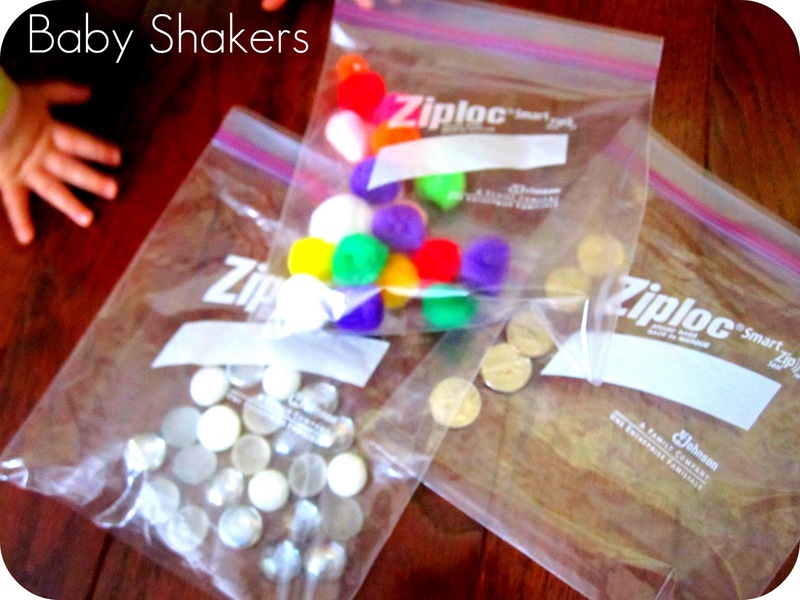 Objects to fill up bags could include: pebbles, beans, pom poms, money (different sizes make cooler sounds when shaken), jingle bells, little people, little blocks, etc. Just make sure you are watching your child as he/she plays... since the bags could accidently unzip! It is also fun to shake while you sing your favorite songs. Ours is the Itsy Bitsy Spider! I liked this activity because it allowed us to explore our senses of sight, touch, and sound... and I talked about them while we played. 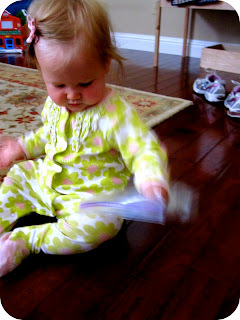 The ziploc bags were also really easy for the baby to grasp and shake. I can't recommend under children three playing with plastic bags and small pieces! so I can't share this! Definitely don't share or do anything you don't feel comfortable with. I have no problem with my kids shaking plastic bags with me sitting next to them, but understand other people have different opinions.